WASHINGTON (AP) - President Barack Obama pushed a key foreign policy goal a step closer to completion Wednesday with the signing of documents for a nuclear arms treaty with Russia. The treaty is a cornerstone of Obama's efforts to "reset" U.S. relations with Russia. 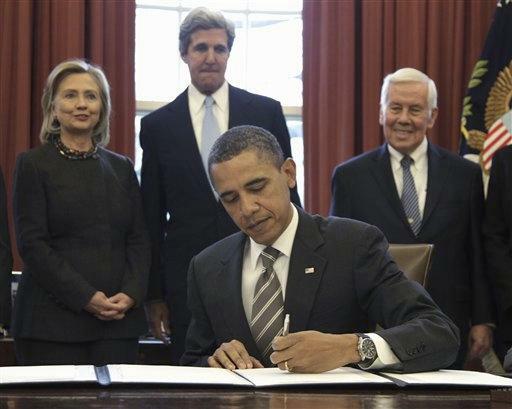 Although Obama, Secretary of State Hillary Rodham Clinton and other administration officials had argued strongly and repeatedly that the treaty was a key foreign policy goal of the president's, he signed the documents in the Oval Office in the presence of news photographers only. Obama also did not issue a statement afterward. He was joined by Clinton, Defense Secretary Robert Gates, Senate Foreign Relations Committee Chairman John Kerry, D-Mass., and Sen. Richard Lugar, R-Ind., the committee's top Republican, among others. Russian President Dmitry Medvedev signed similar documents last week after the treaty cleared Russia's parliament. The U.S. Senate approved the pact in late December after Obama and others lobbied hard for passage. Ratification becomes final when the U.S. and Russia exchange the signed papers. Clinton and her Russian counterpart, Foreign Minister Sergei Lavrov, are set to make the swap this weekend when they meet on the sidelines of the Munich Security Conference in Germany.